When it comes to designing a room for pre-teens, especially boys, you have to be really careful to choose a theme that is not too grown up, but that they will not be embarrassed by within a couple of years. As the excess of bulky, brightly coloured toys get put aside in favour of X-box and board games, this age range need a room that is relatively smart and a little more mature, but that also reflects their childhood interests. 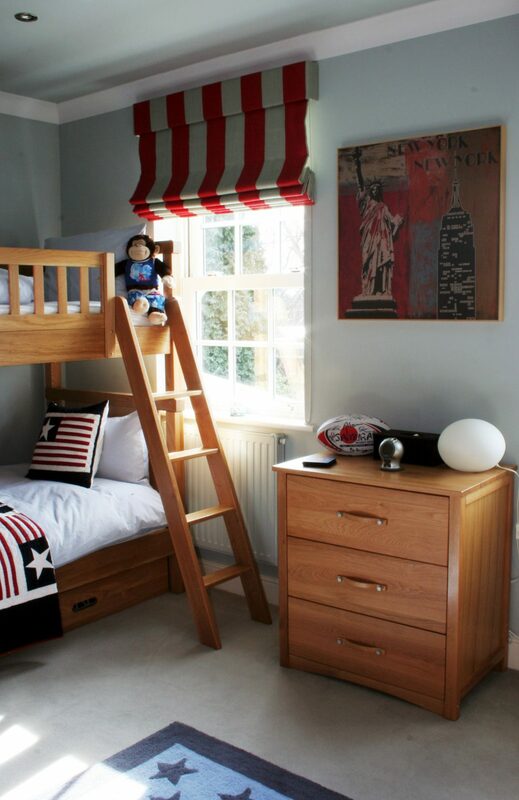 This room in a house we recently completed was designed for two brothers who fitted the pre-teen category perfectly. 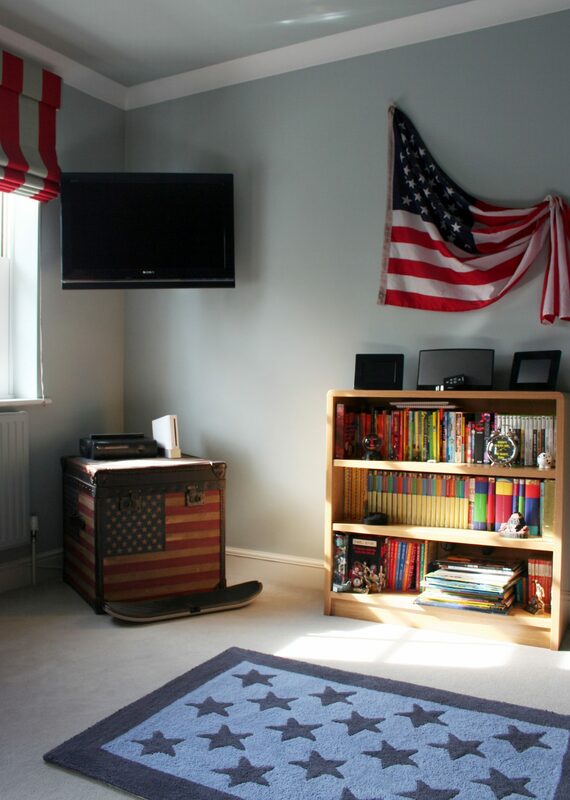 A flag theme based around the Stars & Stripes indulged their passion for all things Stateside and allowed the use of blue as a dominant, but not dominating colour though out the room. This simple colour palette, furniture and blinds provided a basic bedroom design that can be adapted as tastes develop without any further major expense. Flags were introduced in cushions and bed throws, a star covered blue rug and the great square Stars & Stripes trunk from Halo. 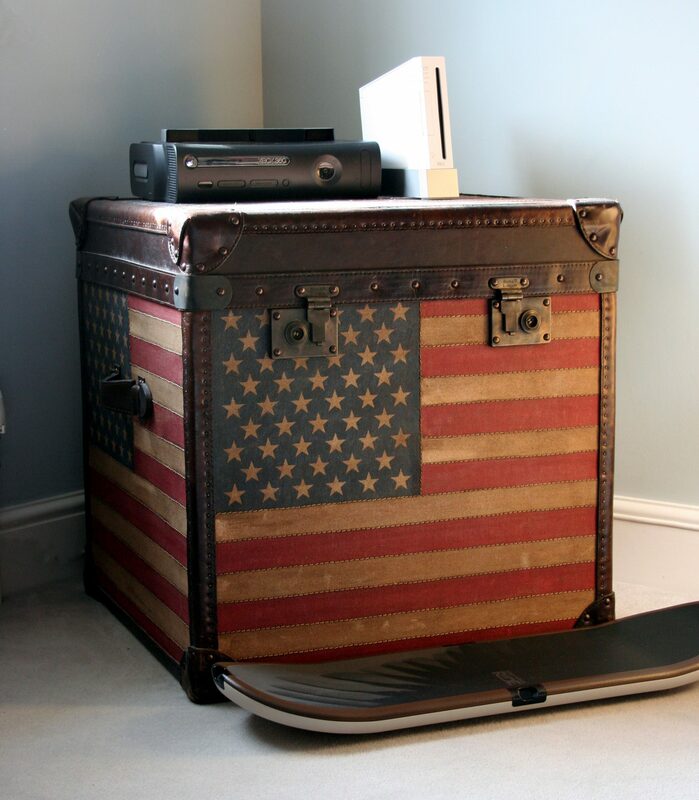 The walls were dressed with USA themed art and a draped “antique” American flag (actually a brand new cotton flag that was left in cold tea for a couple of days) to provided a final, strong focal point.